The ICC World Cup 2015 Cricket tournament is on. For us, Indians, this is the most important sporting event every four years of our lives. And since a one-day cricket match is about 6 hours of play (okay, Americans, do not overreact; that’s approximately how long it takes to WATCH an average NFL game!!! ), it means 7-8 hours long parties with lots of friends, foods and drinks. Consequently, this also means a lot of cooking, cleaning, and dishes for the hosts. So people frequently ask me to post easy recipes with minimal cooking and chopping time that are also good for entertaining. In this regard, I think, nothing beats tacos. I love tacos because of its endless possibilities of flavors. It makes for fun and pretty presentations, gives you the opportunity to easily diversify the spread such that everyone finds something they like, and gives people the flexibility to build their own tacos. This also means fewer dishes (I use paper plates and cups) and no waiting around the tables. For the India Vs. Pakistan match (yaaaaay!!! 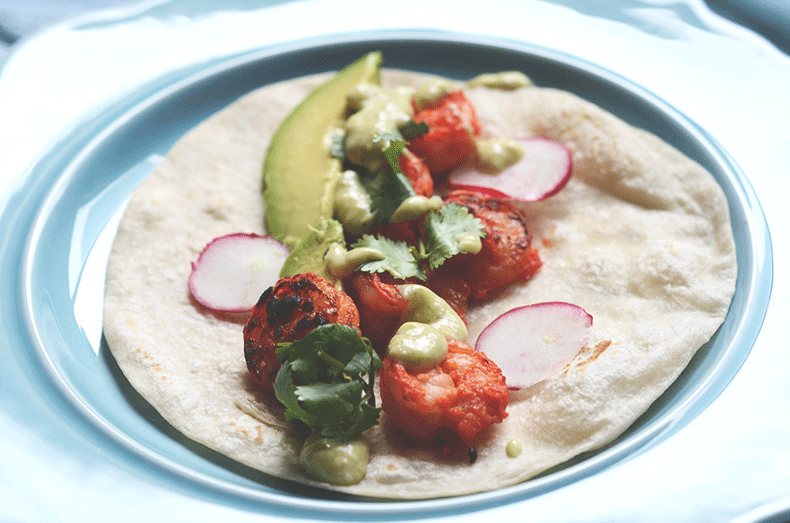 ), I made these Indianized/Pakistanized taco, marinating the shrimp with tandoori spices, and they came out delicious! You can totally use chicken/fish/paneer or other veggies instead. I used pickled radishes, but pickled onions will make for a very tasty substitute too. Go ahead and experiment with this recipe, find a version you like and share it with us!! 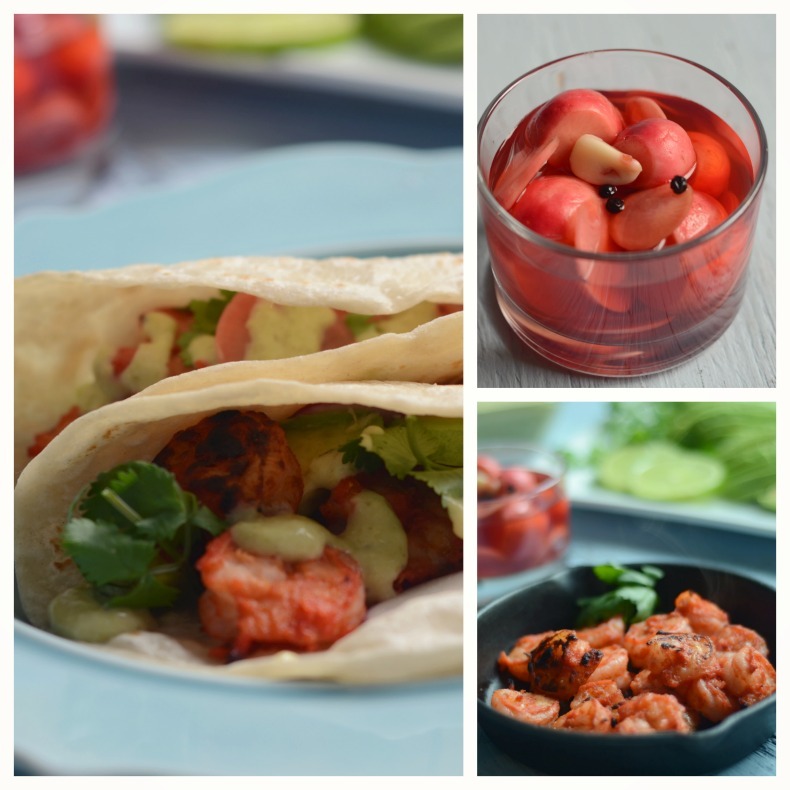 Mix all the ingredients listed under tandoori shrimps in a bowl, cover with a cling wrap and refrigerate for 30-45 minutes. While the shrimps marinate, mix all the ingredients for roasted jalapeno aioli in a food processor into a smooth paste. Chill for 30 minutes. 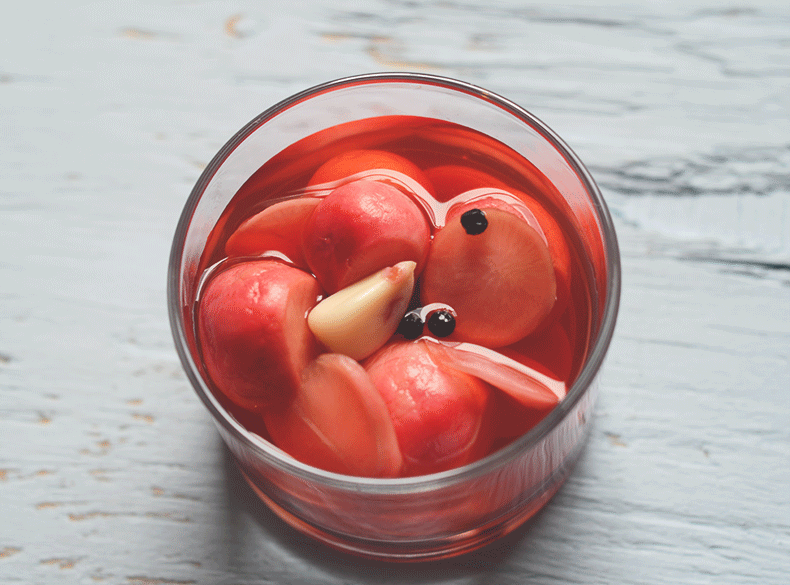 For the pickled radishes, bring the water to a boil, remove from heat and add all the rest of the pickling ingredients. I like to slice the radishes after pickling them, but you can slice them before pickling too. Line a baking tray with aluminum foil, grease with oil and evenly arrange the shrimps on the tray. Broil for 5-6 minutes on each side. 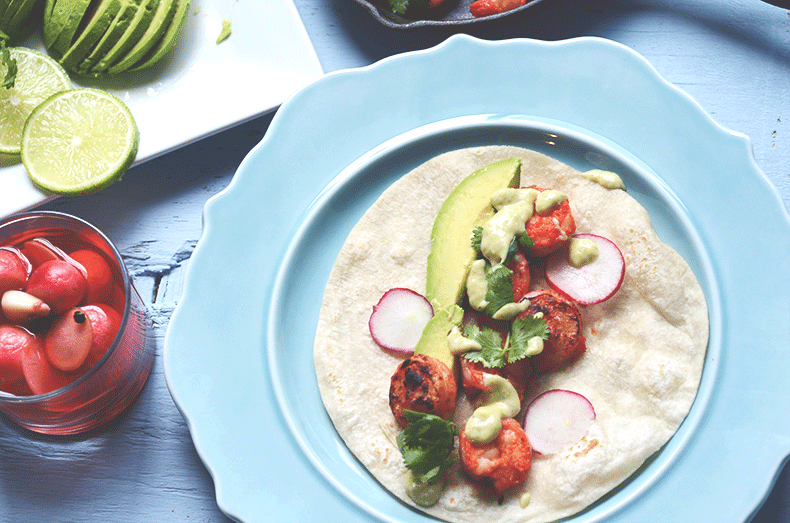 Warm the tortillas and serve with the tandooris, aioli, pickled radishes, lime wedges, cilantro, and avocados immediately. You can also add stir fried onions and bell pepper for extra deliciousness. Find the recipe here. 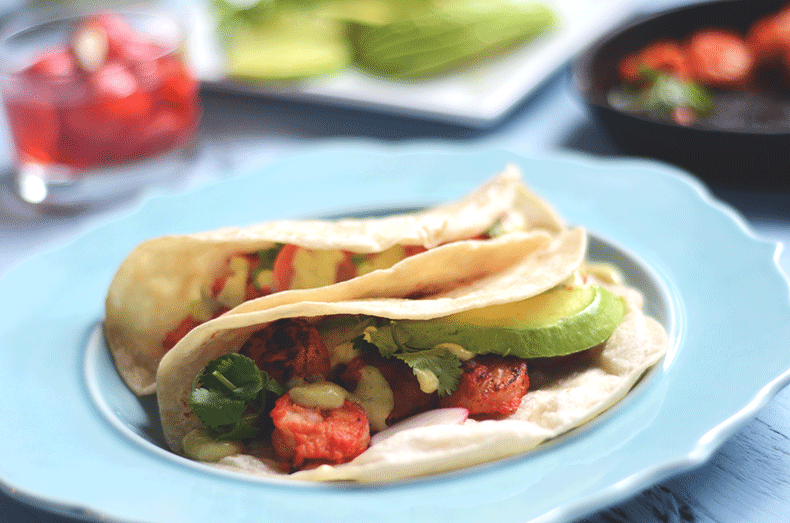 Craving tacos right now after seeing this post -they look delicious!